If people look up your business information on social media, then it’s important for the information they find to be accurate. A potential customer, who has trouble calling or visiting your business because of old information, is unlikely to convert. It’s important to keep track of what business information is where, so that when something changes, you can make the changes as easily as possible. It is also important for your brand identity to maintain consistency across your social media accounts. That doesn’t mean your images have to be identical; they just must be in line with your business branding. Before spending time updating a social media network, read through our blog Social Media Networks You Should Use, to get help determining whether your target audience is using each network. This will help reduce the time you have to spend to get results. For your business, it is crucial to keep any information someone might use to contact you up to date. This includes: phone numbers, address, hours, email addresses, and interconnected social media accounts. These items probably don’t change very often for your business, so it’s important to make any changes quickly, and across all social media accounts that have them. Updating header/cover images and profile pictures should happen as needed, to support your current business goals. For example, you may be promoting an event or sale, and it might make sense to update these images to support your goal. Each social media platform offers different options, and you may not use all the options available on any platform. 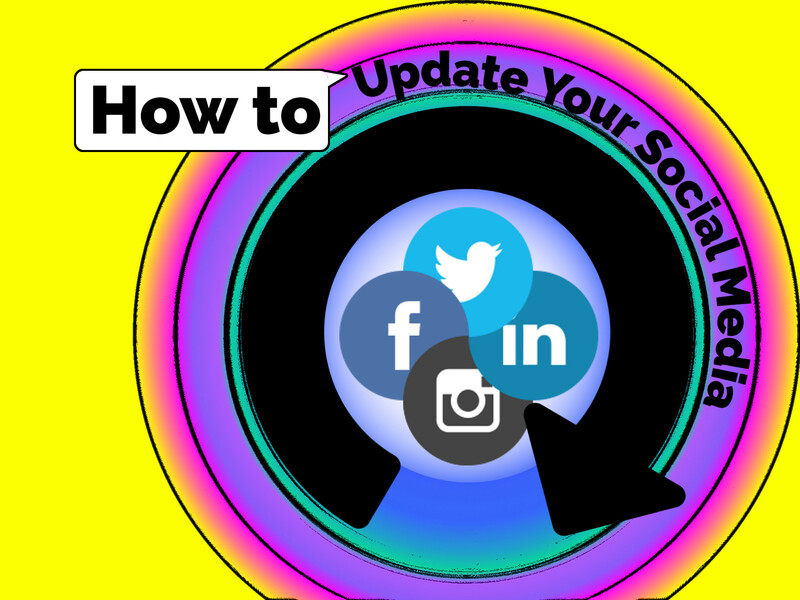 You do want to make sure that you’ve filled out enough options for your social media account to look complete. Let’s look at some specific social media platforms. Facebook offers Pages and Groups and includes different options for each. Pages in any category include short description, website, services, ratings & reviews, email, and phone. Some Page categories also include address, map, business hours, and check-ins. These also give you an idea as to what a complete profile looks like. If you have a local business where customers can visit you, it makes sense to use the extra features available under the category ‘Local services’ and allow people to find your address and check-in at your store. Facebook provides instructions for adding information to your Page here. You can also include a call to action button on your Page. Click on ‘+ Add a Button’ under your cover photo, select a button from the menu, and fill out the information. Click on ‘Add Button’ to finish. Facebook has more about adding your call to action here. You can add more functionality and customization by adding or rearranging tabs, which also rearranges the associated sections. You can read directions to manage these tabs here. There may or may not be additional tabs that would make sense for your business. For example, in the past, we had an additional tab for our online scheduling portal, so customers could schedule directly through our Facebook page. According to Facebook, they are rolling out a new Page feature to allow people to checkout directly on your Facebook Page. If checkout features are available to you, your Page must have the ‘Shop’ tab enabled to see them. You can choose to have customers check out on your website or ‘Message to Buy’ instead of checking out on Facebook. See here for more information about the Shop page and checkout options in Facebook. You can link your Instagram and Twitter directly to your Facebook Page by connecting them. See here for directions on how to do this to automate some of your social media. For more information on Facebook Pages, see here. Facebook Groups have only a few of the features available to Facebook Pages. This doesn’t mean you should prefer Pages over Groups; as you’ll see, Facebook Groups are organized around a different goal and information scope, so don’t need all the features from the Pages. In your Facebook Group, you can choose the group name, the customized email address (more on this below), the type of group (including group type ‘Buy, Sell, Trade’), the tags (or topics) describing your group, the location of your group if it’s location centric, whether there is a pinned post, and how the group feed is sorted. This is designed to keep your members engaged, even if they aren’t on Facebook. For more information about Facebook Groups, see here. There are 5 parts of a Twitter profile3, including your username, your profile picture, your 160-character bio, your header image, and your pinned tweet. Twitter recommends using the pinned post to promote your ‘biggest, latest news’. If you include contact information in your Twitter bio, make sure to keep it up to date. If you want more information about completing your Twitter profile, check out this link. Twitter also provides some guidelines for What to Tweet4, and some help on how to interact with customers5. Your Instagram profile has a photo, biography, and a link to your website7. Make a note if your biography contains additional business contact information that may need to be updated in the future. Before you can use Instagram’s business features, you must convert your Instagram profile to a business profile. Facebook provides directions here. Once your profile is a business profile, you’ll be able to “get insights about followers and posts, and promote posts to drive business objectives—all within the Instagram mobile app”6. You can find more information about insights, and promotions from Facebook. You can setup your company profile on LinkedIn, and they provide several best practices to do so8, including: add your company logo and a cover image, include key words in your company description to optimize for searches, add a showcase page if there is a subunit of your company that uses a different communication style to target a different audience, post daily company updates, track your progress with the analytics tools available, promote content to your target audience, and perhaps even add a ‘Career Page’ to find job candidates. For more information about best practices on LinkedIn Company pages, see here. Make sure the social media accounts you are using and promoting appear complete to any visitors, are updated regularly, and maintain visual consistency, so visitors can be sure the social media account they found really is for your business.